How long has it been since Hillary was caught using her private server? Almost 6 years? You guys are chasing a pipe dream, if she isn't in jail by now then she's not going to be. To clarify, I think she (among many others) probably DESERVES jail time, but this crap has dragged on so long that it's obvious nothing is going to come of it and that TPTB are just dangling the carrot at the end of your stick hoping you keep chasing it. Just my opinion though. Two different branches of government. The Legislative Branch makes the laws. The Executive Branch enforces them. The Judicial Branch interprets them. The DoJ is vacating their lawful duty, and because of that, it is a slap in the face to America like a statement saying they don't need to obey any law like government had to traditionally. If I was president and saw any agency of the country do this I would send armed troops -Marshals in to confiscate the requested documents and arrest anyone attempting to stop them. When just one official refuses a lawful constitutional order like we have seen so many doing these days, then the behavior spreads into all of them, and then they all begin thumbing their noses at the rest of the country. We saw Bush do it, then Clinton, then Obama and Hillary and all their helpers in high places doing it all over the map. It spread like a virus and their are still quite a few encamped and continuing this new illness. Eventually if allowed to continue, this will destroy America. They use mass media partisan bigotry to shield themselves and fend off responsibility. It's maddening to see it go uncorrected and unpunished. oh! sorry the guard dogs eat it! The DOJ said that the House Intelligence Committee could see the document "on camera" only. Maybe they did take a photo of the document and then shredded it. That photo of the document could be doctored to say anything! If I had dirt on Hilary... I would dig a deep hole, and hide. 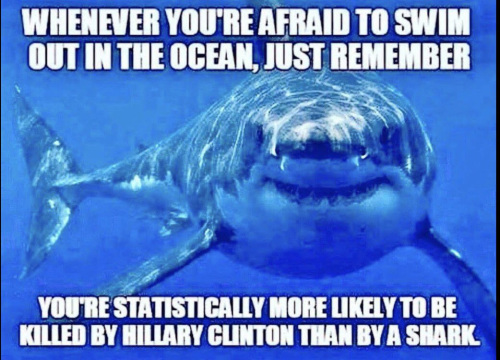 The entire "Jaws" franchise had fewer fatalities, than the Clintons have left in their wake. edit on 6-4-2018 by madmac5150 because: Gattafinga! The corruption runs too deep. The depth of it being known by the public would bring down the entire house of cards, [government).. The Judiciary Congressman hinted at that today. He said evidence thus far indicates that there have been "many" abuses of the FISA law to spy on Americans. Not just the Trump campaign and Presidency. Adam Schiff was one of those cursed out by former Trump campaign manager, Corey Lewandowski recently. I bet they already have seen these documents un-redacted. The appearances of confusion and un-compliance might just be for keeping opposition and deep embedded swampers in a comfort zone. The strategies have been working so far.